Holiday rental in the 1st floor of a beautiful villa situated in the edge of the village of Scolca (Haute-Corse) in approximately 600m of alt. Mountain frame but the sea is not far (in 25 mn) and Golo, torrent where we can practise the bathing, fishing and other river sports at 10mn from the village. Holiday rental in Corsica, within a small property situated to Erbalunga, nice little marina, 9 km from Bastia opening on the Cap Corse, its hikes, its wild sites and its beautiful small villages. Self-catering apartment for 2-3 pers opening on a small wooden terrace with little sea view and a small garden. Pets allowed. Rent a beautiful apartment T3 for 6 people in Haute Corse, St Florent, facing the sea. 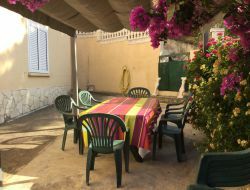 Rent of a small renewed holiday home in a quiet village of the center Corsica, in 10 min from Corté, in 50 mn from the beaches (Ile Rousse, Calvi), near the massifs of Cinto and Rotondo. Numerous possible hikes towards lakes and various summits and a few minutes away from very beautiful rivers (Restonica, Tavignano, Golo, Asco), riding school and climbing site in 5 mn. 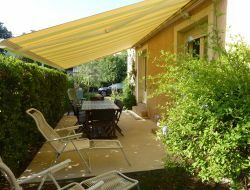 Rental in Cape Corse of a new house, modern, 3 bedrooms (6 people), large living room, air conditioning, enclosed garden. Holiday rental near the sea and mountains. Many activities available: hiking, swimming, scuba diving, horseback riding. Rent of mobilhomes - chalet 4 to 6 sleepings around, all equipped in the camping Ficajole between sea and mountain in the region of Castagniccia in Corsica. Ping-pong, games of bowls and outdoor games. Holiday accommodation in the Cap Corse : independent apartment at the ground floor of a villa with garden, individual car park, raised environment and tennis courts. 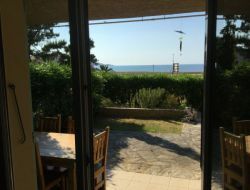 Holiday rental situated in 100 m from the beach dominated by a beautiful Genoese tower. You will be for the peace and in the middle of nowhere. 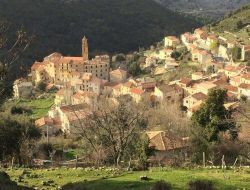 Holiday rental for 4 people in a quiet village of the center of Corsica, which kept all its authenticity. Sunny terrace with table, chairs and parasol. Rent situated in 10mn from Corte, 1 h from Bastia, 1h30 from Ajaccio time and Porto. Numerous hikes towards the valley of Restonica (with the lakes), the valley, the mountains massif, without forgetting rivers and beaches. Privative car park. 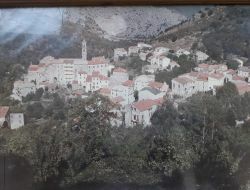 Holiday cottage for 2-4 people at the heart of a village Castagniccia, in a building from the late 18th century, with open views over the valley and the river "u Golu", 12 km of beaches. Air conditioned or heated cottage.